[prMac.com] Perg, Austria - Ergonis Software today released PopChar X 8.2, an improved version of the company's award-winning tool for finding and inserting special characters and exploring fonts. With this new release, Ergonis made a great job in enhancing and refining the recently released version 8 of PopChar X. One of the outstanding new features of PopChar 8 is doubtlessly the possibility to create custom layouts and link fonts to preferred layouts. This allows you to design tailored layouts for particular workflow situations, which leads to even quicker access of frequently needed special characters. 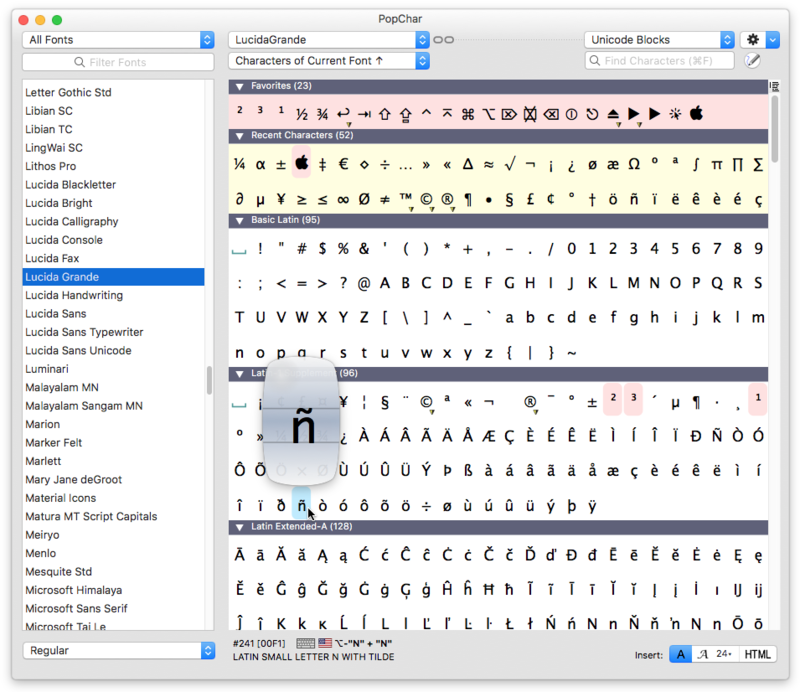 PopChar 8.2 extends the notation options for custom layouts. It is now possible to add a bunch of characters with just one smart directive in the layout description. You can, for example, add all characters from a named Unicode block, or all characters that match a certain search string. In addition to that, PopChar X 8.2 offers some fixes and workarounds for user-reported issues. Visit Ergonis Software's website to learn more about the changes in this release and to download the new version. For topical reasons, Ergonis Software is pleased to announce that PopChar X 8.2 is fully compatible with macOS High Sierra, which has been released by Apple just a few days ago. PopChar X 8.2 requires Mac OS X 10.6 or newer and is compatible with macOS High Sierra (10.13). PopChar X can be purchased securely on the Ergonis Software website. The upgrade to PopChar X 8.2 is free for anyone who purchased a license for PopChar X 8 or for PopChar X 7 on or after September 1st 2016. Upgrade paths are available for owners of older licenses. For information about purchases, including enterprise licenses, volume discounts, and upgrade pricing offers, see the company's web site. Instead of purchasing PopChar separately, customers can save money by ordering the Ergonis Productivity Bundle, which also includes the text expander Typinator and the keyboard shortcut helper KeyCue. Ergonis Software develops ergonomic and intuitive software that boosts the productivity of Mac and PC users. Ergonis Software, a privately held company founded in 2002, is headquartered in Perg, Austria. Copyright 2002-2017 Ergonis Software Gmbh. All Rights Reserved. Ergonis products are either registered trademarks or trademarks of Ergonis Software GmbH. Other company and product names may be trademarks of their respective owners.